The choosing a suitable pair of climbing shoes has more subtlety than one might think. I learned the hard (and expensive) way by getting a wrong fit for my first pair of climbing shoes. My first pair was so tight that my toes would be dead numb if I wore them for more than five minutes. Only two months after I bought them, the rubber wore out until holes appeared. The first thing to feel for when trying on a pair of shoes is the fit. 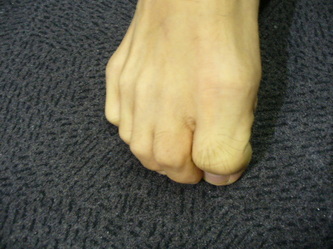 The shape of feet differs from person to person, and climbing shoes should be chosen accordingly. Some shoes are made for wider feet, others for narrower feet, and some for feet with deep heels. There should not be any spots that are extra tight or extra loose relative to the whole shoe; rather it should fit snugly. Another thing to consider is the position of the toes inside the shoes. 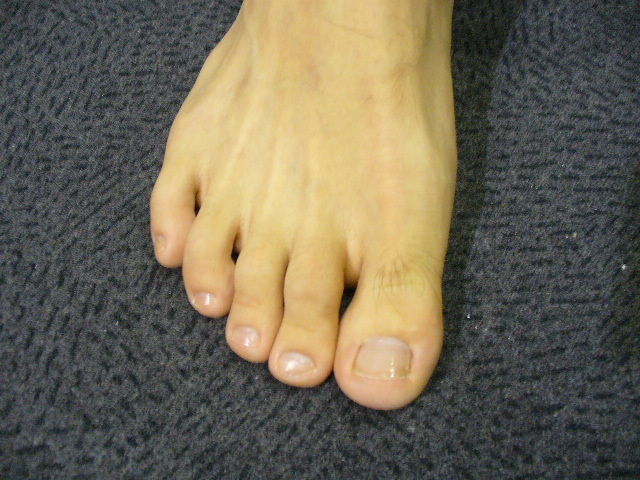 The toes should not be straight like when wearing regular shoes, but neither should they be in a fully crimped up position. Somewhere around the middle of these two extremes should allow you to put weight on your toes without them hurting too much. When trying shoes, test this by standing on small edges (or climbing footholds if the shop has some). If these are not available, take small tip-toe steps. 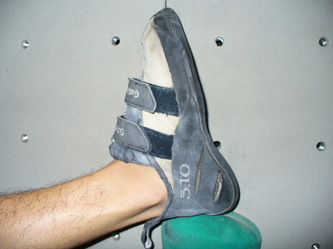 Most climbing shoes fall into two categories: flat soled or down-turned. 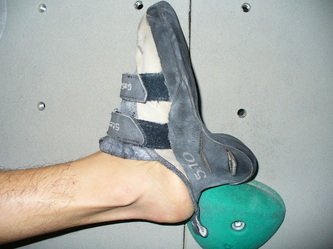 Flat soled shoes are well suited for slabby to vertical terrain, while the beak-like toe box of down-turned shoes give extra pulling power on overhangs and roofs. For a first pair of climbing shoes or a general all-rounder shoe, go for a flat soled shoe, as the shape of a down-turned shoe makes it difficult to rest the feet muscles even if you are standing on a good foothold. Something to keep in mind is the tightness of the heel of the shoe. You should try heel hooking a foothold or the edge of a stair/table to test if the heel would slip off like in the picture below. This would be especially important if you are planning on using the shoe for climbing steep terrain or bouldering. When trying shoes, be sure to try on both sides, as the left and right feet of most people are not of the same size. You definitely do not want to be trying only right sides in the climbing shop and arrive home to realize that your left shoe is uncomfortably tight. Last but not least, make sure to choose the right rubber hardness for your purpose. Hard rubber has more durability but is lacking in stickiness, while softer rubber trades off the durability for more stickiness. Hard rubber is better for beginners, as the durability is important during the initial stages of your climbing life when your footwork is not precise, resulting in the loss of a lot of rubber. Soft rubber is suitable for experienced climbers climbing hard routes with small or slopy footholds where the extra stickiness might make the difference between a send or a fall.